When a development project takes place in a community, it can have both positive and negative impacts on the people and ecology, where we live. In particularly, the group of people who can least protect themselves are the children and young people. The concept of ecological child rights (ECR) was originated to promote and protect the physical, mental and spiritual (Bio-Psycho-Social) development of children. Therefore, any development projects, that potentially harm the environment where children are born and grow up, must seriously integrate the ecological child rights into the decision-making process. Over the past few years, The Mekong Youth Assembly have conducted many workshops focusing on ECR. 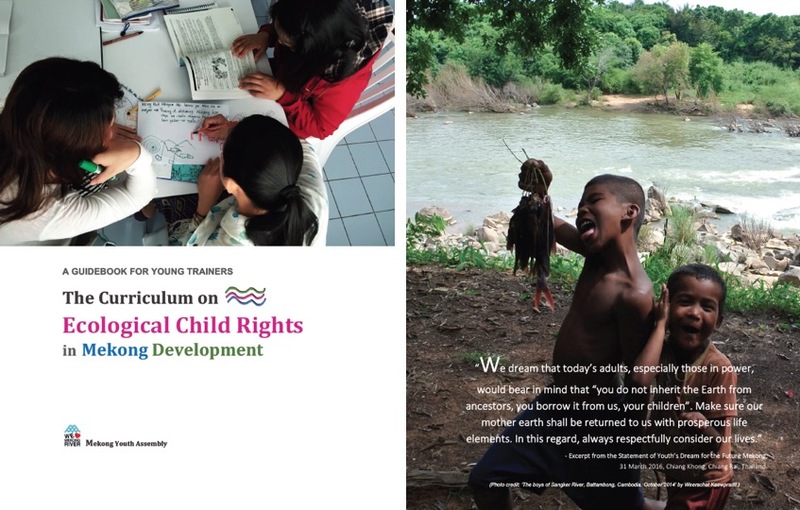 This Curriculum on Ecological Child Rights in Mekong Development is the fruit of the collective experiences of working with hundreds of children and young people in the Mekong Region. This guidebook is for young trainers to conduct ECR workshop for youth. We are pleased to share our experiences with you. We have chosen to present our models and tools in a very similar way to how we conducted at training in the Mekong countries. We also look forward to future opportunities to discuss this model from many other cross-cultural perspectives. Ultimately, we hope to help plant more seeds as for children to become aware of their ECR, and for the children to engage in decision-making that affects their lives on all levels, and to defend our rights to have clean soil, air, and water –a safe and secure environment so that the children of today and tomorrow may grow and shine! At the moment this guidebook is only in English. We promise to make it available in other Mekong languages in the near future. Stay in touch. Please feel free to use and share this guide book with your friends, colleagues, and family! Note: This post was originally written by Mekong Youth Assembly.